Tip # 10 - Make Changes and Additions with Care. 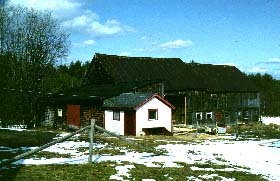 Changing agricultural buildings is a tradition on Vermont farms. Often owners alter buildings so that they can continue to use them and pay for their upkeep. If you need more space, you can add onto your barn. It is usually quite easy to adapt a barn or enlarge it and still keep its historic character. Many additions to barns were made in the latter half of the nineteenth century. Farmers adapted earlier multi-purpose barns to specialized structures or added onto smaller barns to make large multi-purpose barns. Often two or more small barns were attached end-to-end on a raised foundation to create a large bank barn. In the twentieth century many dairy farmers poured concrete in the basement of a barn or raised a barn on a new concrete foundation to create washable floors for a ground-level cow stabling area. Unless older additions are a threat to your building because they were poorly done, they should not be removed; they are an important part of its history. If you plan to adapt a barn to a non-farm use, see "New Uses for Old Barns." If you plan interior changes, see "TIP # 9 - Save Some Original Interior Features." Maintenance problems may occur where buildings have been altered or other buildings attached. Anywhere an alteration pierces or attaches to the exterior of the structure should be checked to see that flashing and other measures to shed water are intact and work. If you can see alterations to the structure of a barn (like missing posts, braces or purlin supports), evaluate them to ensure that they are not creating problems that may not yet be obvious. Connected buildings may move apart as their two foundations heave or settle independently, tearing flashing and creating roof leaks. If drainage was poorly designed when the buildings were attached, foundation problems may develop where they join. Sheds or low-pitch gable roof attachments to a barn may not shed snow properly, weakening their roof structure and creating a water problem where joined to the main building. New additions to a barn should be well planned to avoid maintenance problems and to respect the building's historic character. Generally an addition should not be so big that it overwhelms the main structure. Additions that are slightly lower, narrower, and set back from the wall of the original structure will best preserve the historic form and roofline of the building. The addition should be located so that it does not cover important parts of the original building. Often the least visible side of the original barn is a good choice. Avoid complicated intersecting rooflines that may collect snow and leak as the buildings settle or move under heavy loads. The site of the addition should be properly chosen and prepared so that no drainage problems will develop around the foundation. If possible, siding and roofing materials on the addition should match the original barn. Moving barns is a tradition on working farms, but elsewhere should be considered only as a last resort to save a structure from demolition or collapse. The site of a barn and its place in the arrangement of buildings that make up a farmstead tell much about its history and that of the farm and should be respected. If a building is moved, its new location should be as close to its original location and setting as feasible. If possible, it should be sited so that it faces and is as close to the public road and any nearby buildings as it was on the original site. Remember to consider the archeological potential of any new site before locating a new foundation. © 1995 Vermont Division for Historic Preservation and Vermont Housing and Conservation Board. All rights reserved.